Looking out onto International Drive, hotel guests will see dozens of retail shops, many within walking distance. The area is a mecca for shoppers looking for sporting goods, fashions, electronics, shoes, luxury goods, and just about anything else under the warm Orlando sun. Millions of visitors who come to Orlando each year come ready to take advantage of all the great bargains at the area’s outlets and shopping malls. Many purchase so much while they are here that they buy additional suitcases to get it all home. That’s okay since there are many luggage outlets in the area as well. Most of the great shopping opportunities on this page are within a short drive of the hotel. Rosen Inn International’s staff will be happy to assist you with directions or arranging transportation to Orlando’s great shopping venues. Pointe Orlando® is the closest of the shopping centers on International Drive. In addition to music, movies, and live entertainment, Pointe Orlando has great shopping headlined by top brands including: Charming Charlie, Hollister, Tommy Hilfiger, and Victoria’s Secret. In addition to shopping, you can find cuisine from around the world. Feast on tacos, burritos, burgers and shakes, plates of pasta, sushi, fish and chips, and southern comfort food. Pointe Orlando also has several bars where patrons can sip mojitos, daily drink specials, beer, and classic cocktails. Or, take in a movie at one of the 20 screens or the IMAX Theater at Regal Cinemas. There is plenty of parking in the attached parking garage. Parking comes with a fee; ask the local businesses if they validate. 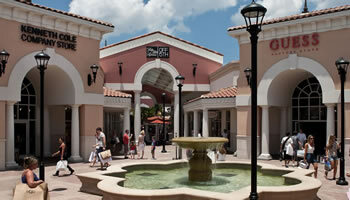 340 top brand name outlet stores offer something for every shopper at Orlando Premium Outlets®. The Outlets offer some of the best deals available anywhere on brand name and designer fashions, housewares, sportswear, shoes, perfumes, and accessories. Top name brand outlet stores include: Coach, Cole Haan, Guess, Lacoste, Nike, and Polo Ralph Lauren. There is plenty of free parking or convenient, paid valet parking. The food court, restaurants, and snack shops provide plenty of dining while shopping. The great outlet deals never stop at Lake Buena Vista Factory Stores®. Customers purchase factory direct, quality merchandise while saving 25%-75% every day. Top outlet names include: Aeropostale, Carter’s, Converse Shoes, roz & ali, Eddie Bauer Outlet, Fossil, Gap Outlet, Nike Factory Store, Old Navy, Timberland, Tommy Hilfiger, VanHeusen, Wilson’s Leather Outlet, and many more! The Center Food Court or Internet Café – World of Coffee has specialty coffees, desserts, and a wide selection of favorite food items. The Florida Mall® is Central Florida’s Largest Mall. 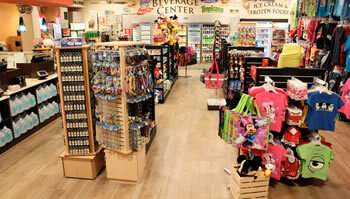 Shoppers can find a huge selection of merchandise among 260 stores covering 1.9 million sq. ft. of indoor shopping. Department stores Dillard’s, JCPenney, and Macy’s are there, along with M&M World, Build-A-Bear Workshop, Hollister Co., M.A.C., Apple, Sephora, and more. In addition to Central Florida’s largest selection of retailers under one roof you will find 30 restaurants and cafes like Buca di Beppo. For those with high-end taste, the Mall at Millenia® is an essential shopping destination. Millenia features an array of luxury stores including Armani Exchange, Burberry, Chanel, Gucci, Louis Vuitton, Prada, Bloomingdale’s, and Neiman Marcus. Millenia’s large selection of stores, includes M.A.C., Apple, Banana Republic, Pottery Barn, Tiffany & Co., and more. Dining options aren’t limited to the food court. With a number of sit-down restaurants including California Pizza Kitchen, Johnny Rockets, and The Cheesecake Factory, Millenia is also a great eating destination.